While on a recent vacation in Palm Springs, CA, we took a day off from golfing to do touristy things. On that day, we visited the Shields Date Garden, where I learned more about dates than I ever thought possible. 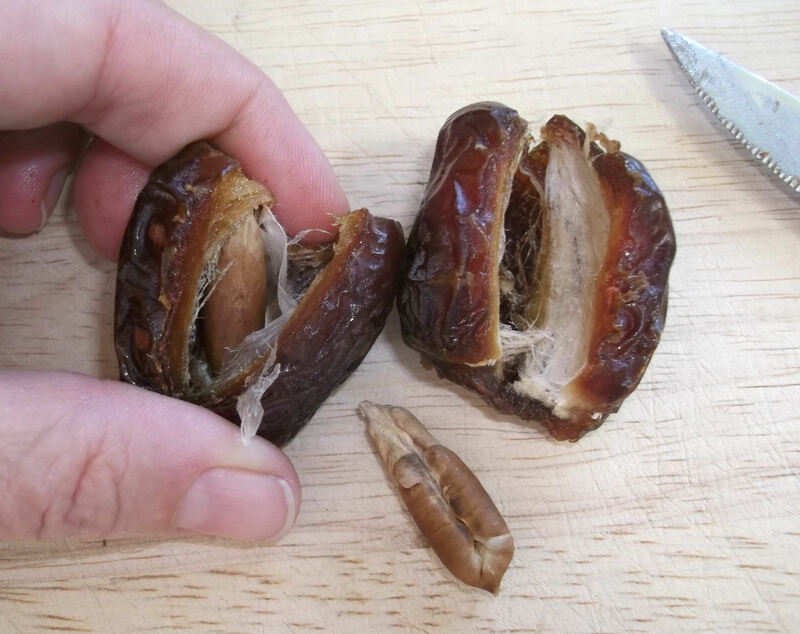 I must confess that I had never had fresh dates before then, but once I tried them, I was hooked. We stayed for a fantastic lunch at the lovely outdoor café, shared one of their renowned Date Shakes, and bought some Medjools to take home to play with. 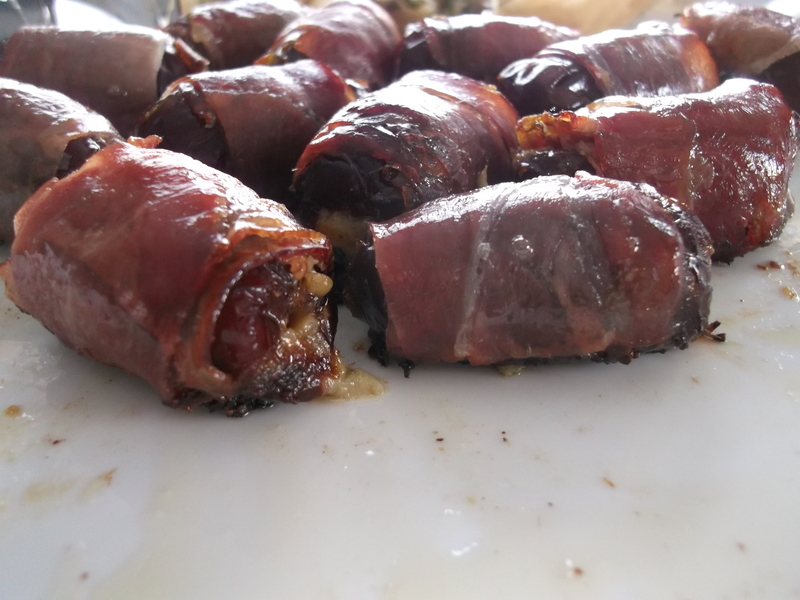 One of the first things I did was stuff them with bleu cheese and wrap them in prosciutto. I don’t know why; it just sounded like the right thing to do. And I still think it is. 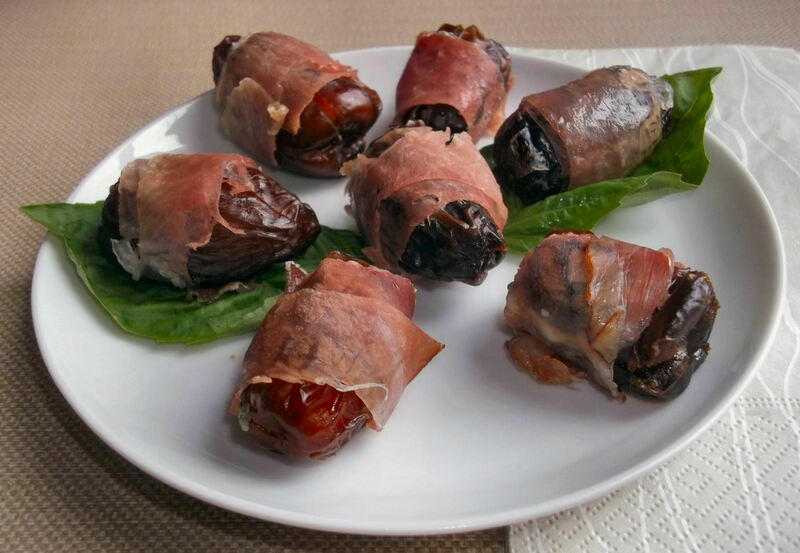 Try these now, while fresh dates are still in season. I’ve found them in the refrigerated fruit sections of my local grocery stores, Trader Joe’s, and even SAM’s Club. 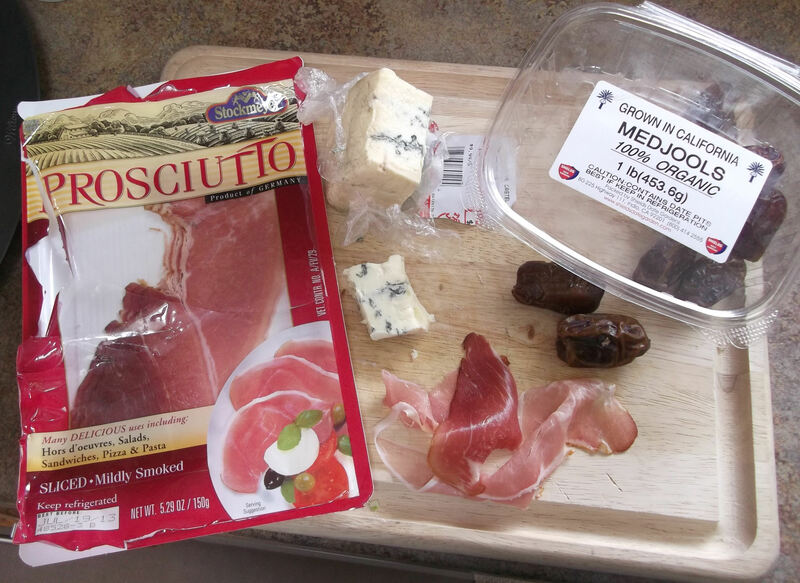 The combination of the piquant cheese, the salty prosciutto, and the sweet dates is amazing. Trim the stem end of the date and slice in half lengthwise through the top, exposing the pit. 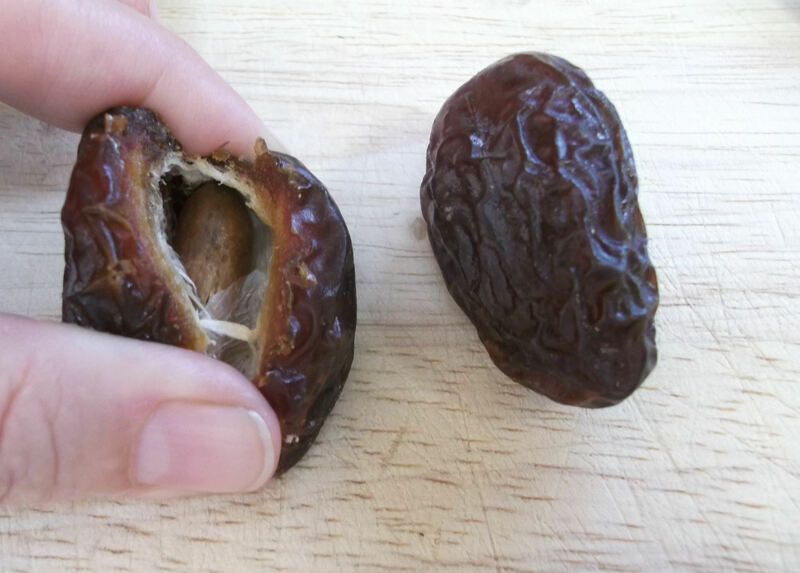 Gently squeeze the date open and remove the pit. Fill the date with bleu cheese (about 1 t or as much as needed to fill the cavity). Don’t overfill: you should be able to squeeze the date back into its original shape. 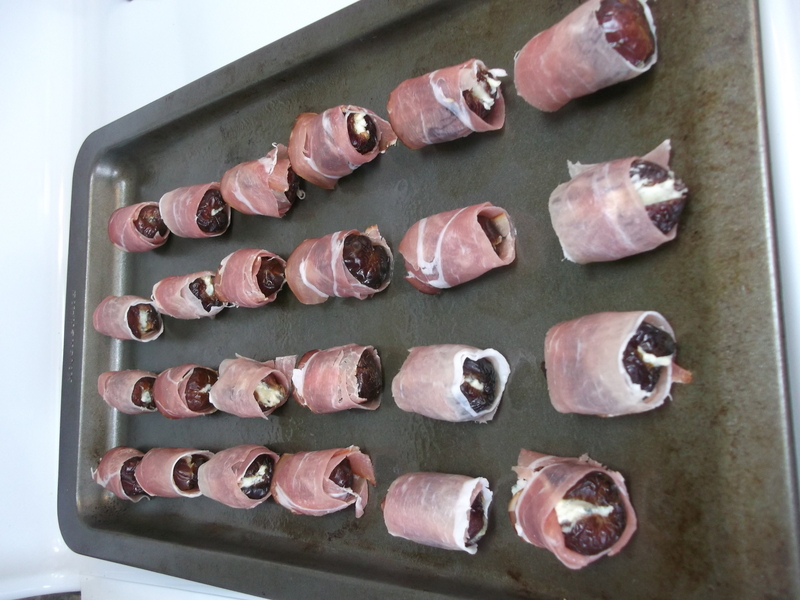 Slice each piece of prosciutto lengthwise into two thin strips; roll each stuffed date in one of these thin strips. Place the rolled dates, seam side down, on a lightly oiled baking sheet. Bake at 350 for 10 minutes or just until the cheese melts and starts to seep out. Serve warm, topped with (optional) basil strips. 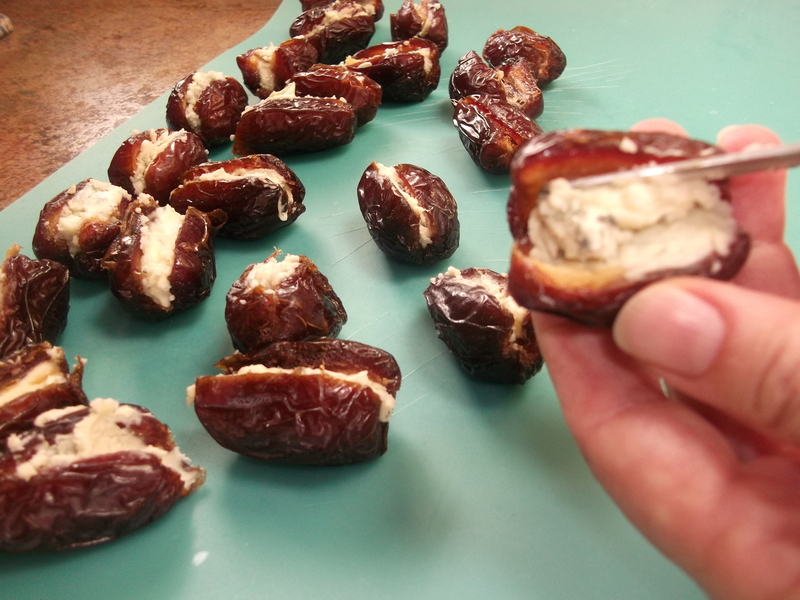 These dates pair remarkably well with red wine. The quantities and measurements of this recipe are pretty loose; use them as a guideline to make as many of these tasty morsels as you’d like. If there is a hard stem end on the top of the date, trim that bit off; not all dates have them. 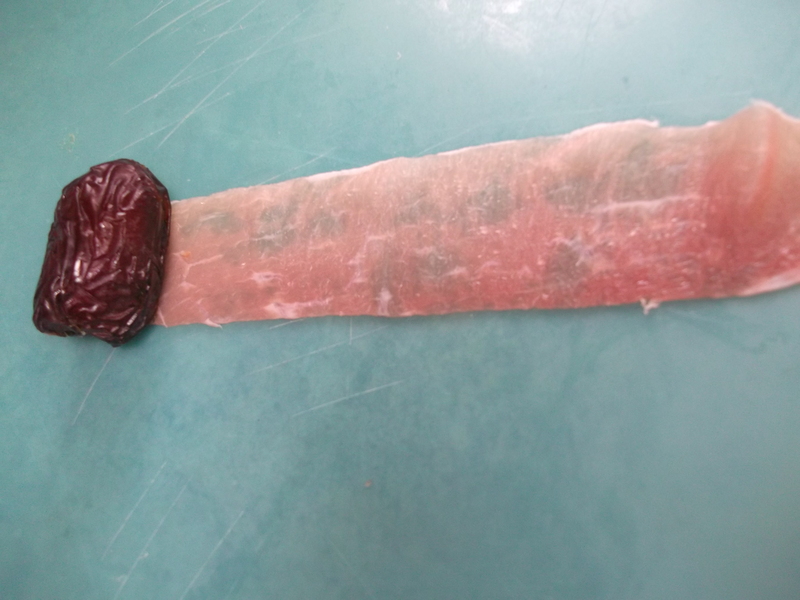 Slice the date in half lengthwise through the top, exposing the pit. 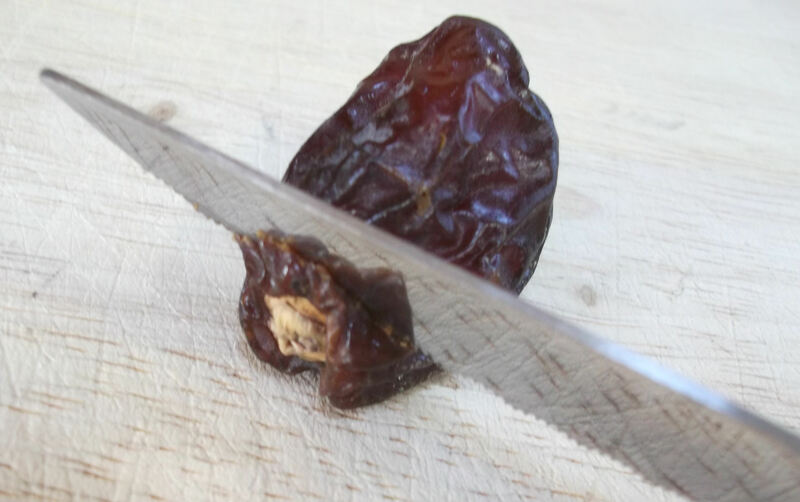 Gently squeeze the date open and remove the pit. Remove any papery bits stuck to the pit, too, if you want. 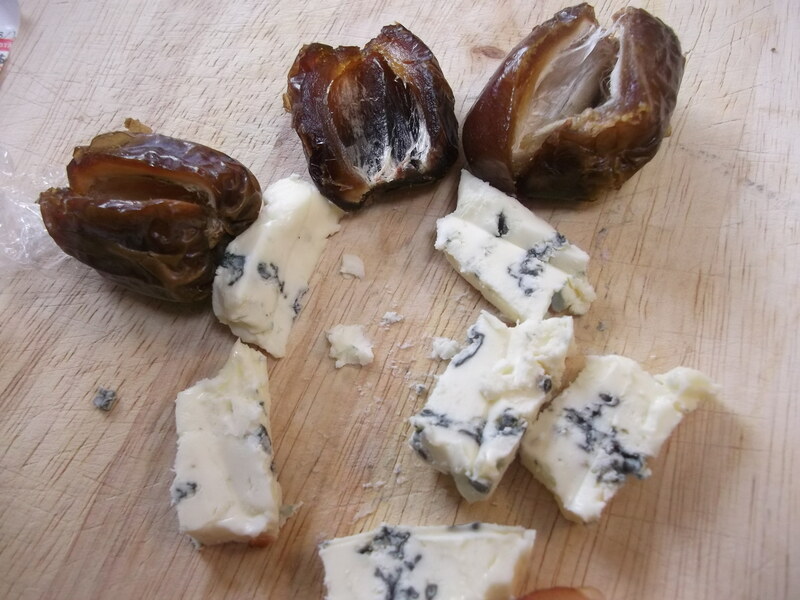 Cut the bleu cheese into pieces roughly the size of the interior of a date. I used a creamy style of bleu cheese, and was still able to cut it. I’m sure a more crumbly style would work just as well. 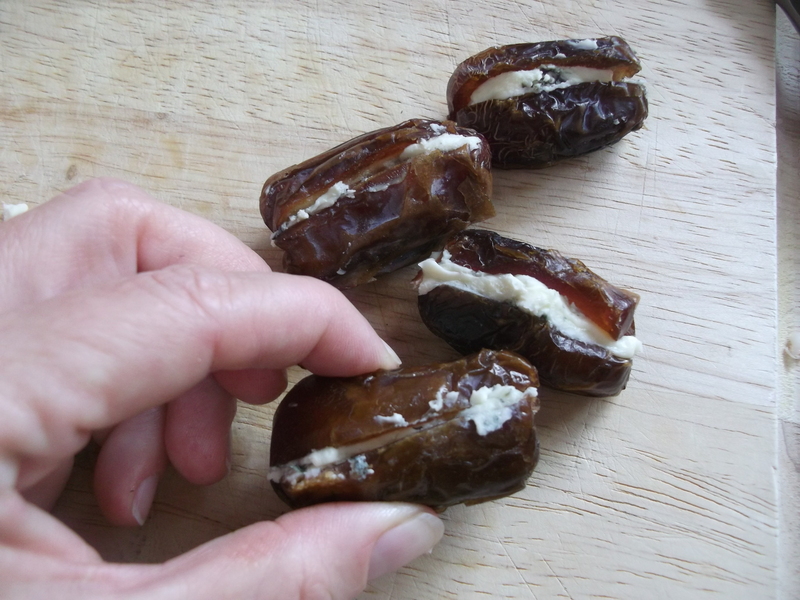 Fill the cavity of each date with bleu cheese. Really pack it in there. Yum. Don’t overfill them: you should be able to squeeze the date back into its original shape without exposing too much cheese. 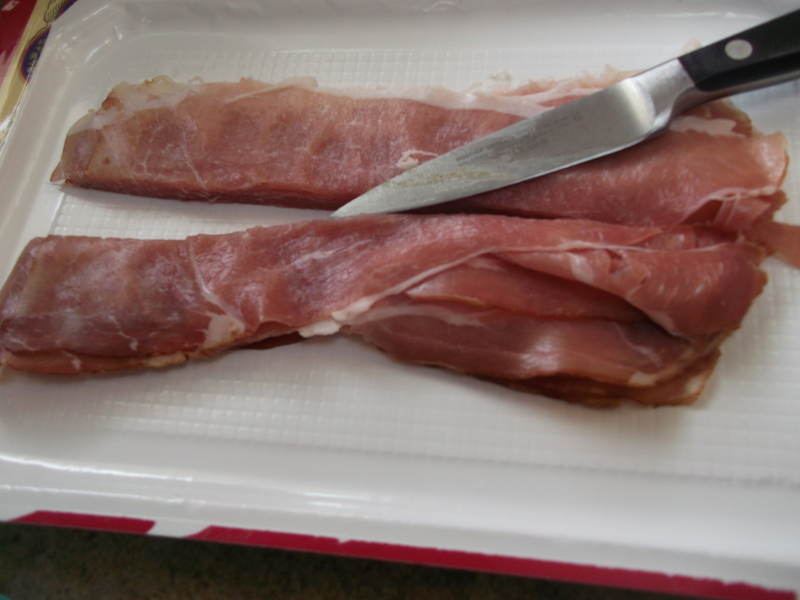 Slice the prosciutto lengthwise into two thin strips. I stacked my prosciutto slices and sliced them all at once. 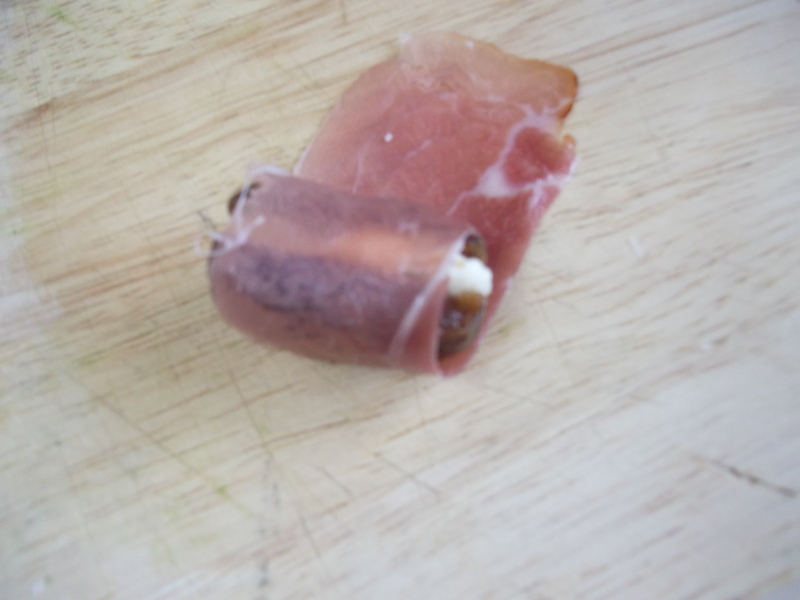 Place a stuffed date on one end of a prosciutto slice. If there is a narrow end and a wide end, place it on the narrow end. Roll it up. Please excuse the change in cutting boards: I made these a few different times, and they were just as delicious on any cutting board. 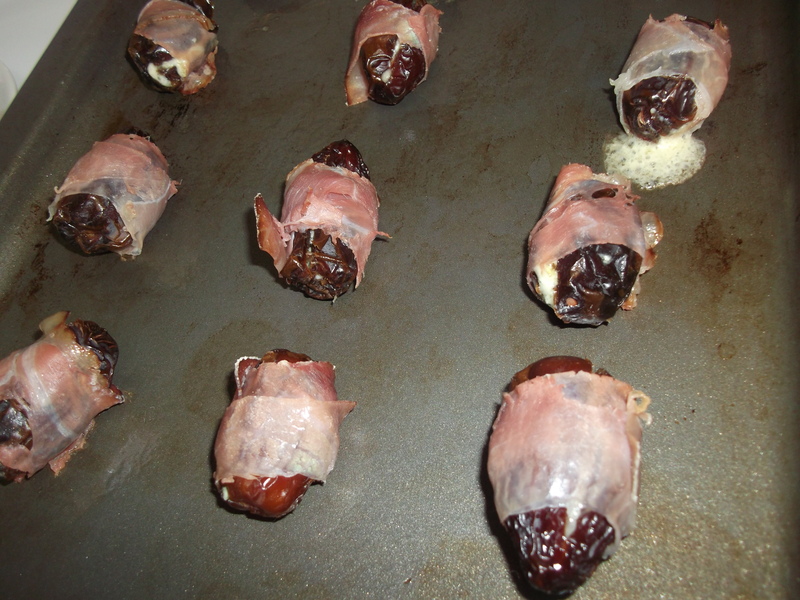 Place the rolled dates, seam side down, on a lightly oiled baking sheet. You can place them fairly close together; they won’t spread out like cookies do. Bake at 350 F for 10 minutes or just until the cheese melts and starts to seep out. The prosciutto will be cooked, even if it doesn’t look like it. I cooked one batch too long, trying to really crisp it up, but found it didn’t really matter. In fact, all the cheese seeped out, leaving a burnt and cheesy mess on my baking sheet (not pictured) with very little cheese remaining in the dates. Don’t do that. Allow to cool for a few minutes and serve while still warm. Garnish them (optional) with fresh basil and pair with your favorite red wine (I would suggest a Cabernet or Petite Syrah). Enjoy! 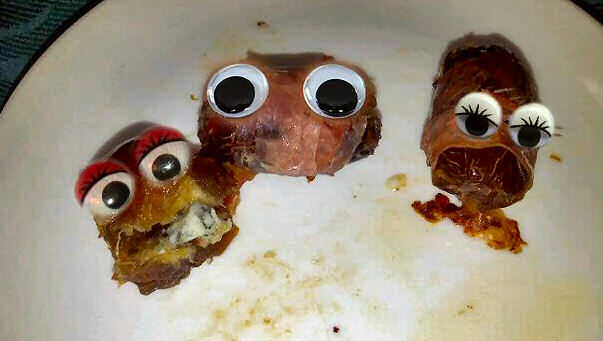 If you have a creative friend like I do, he can add computer generated embellishments to really dress them up for dinner. Gives a new meaning to Date Night. Love the embellishments…they provided my first laugh of the day.